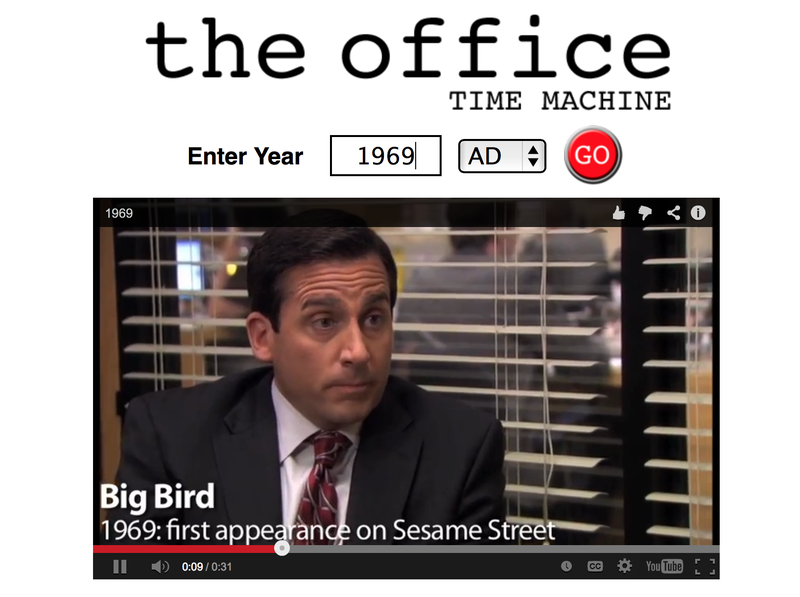 The Office Time Machine is a series of videos that pull out The Office cultural references and sorts they by year. It’s a time capsule of sorts. You can visit the page and watch several years in a row. Sports, Movies, TV, Books, Music, Politics, Food/Drink, Technology, and other references abound. I suggest starting with your birth year – in my case, 1969 and letting it run forward. There’s probably a drinking game that could be developed out of this. To pick your year and start – visit The Office Time Machine. 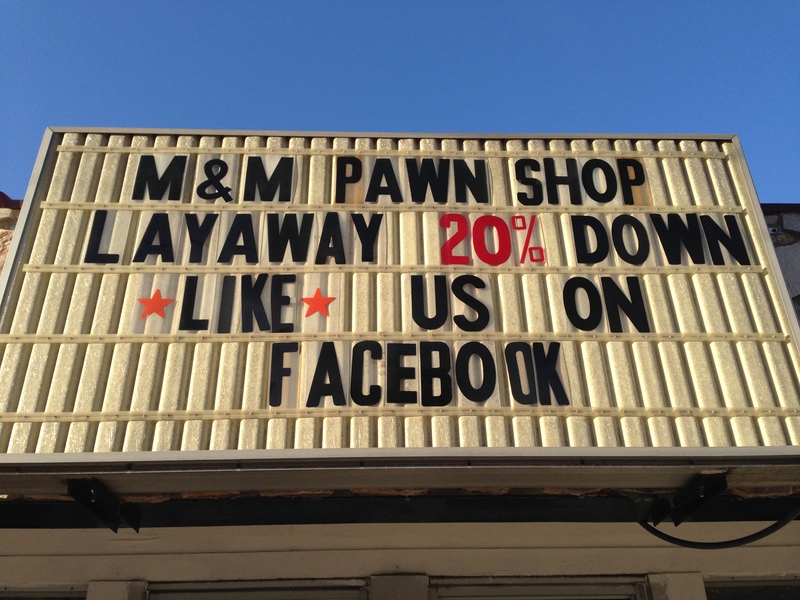 Pawn Shop Social Media? Really??? 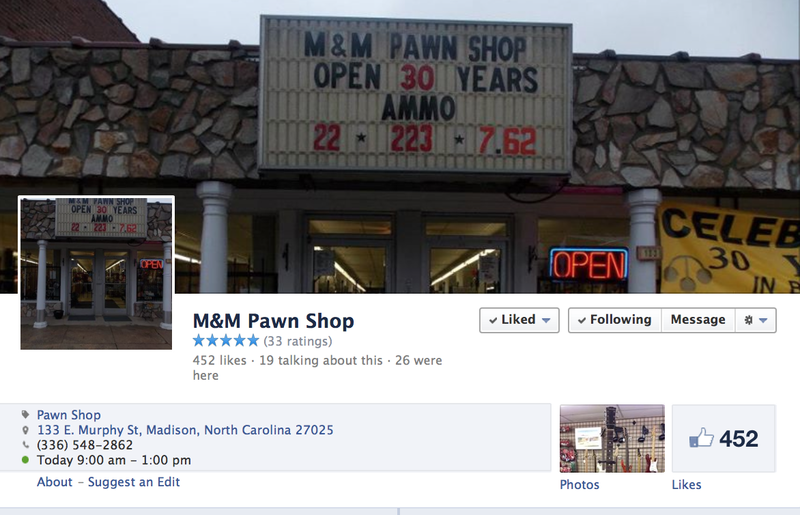 My first thoughts were – Who’s going to like a Pawn Shop on Facebook? And if you’re pawning stuff, do you really have a computer or internet service? Wouldn’t it be kind of depressing? Clearly they need a graphic designer to pawn some stuff or trade for some upgrades to the page. But looking past the aesthetics, it’s pretty interesting. 1) I saw some stuff that that I might want to buy (so the page may be more useful for people purchasing items, rather than those hocking them). 3) Pawn shop or not, it’s great to see a small business linking Bricks and Mortar with Social Media Efforts (because many do not). 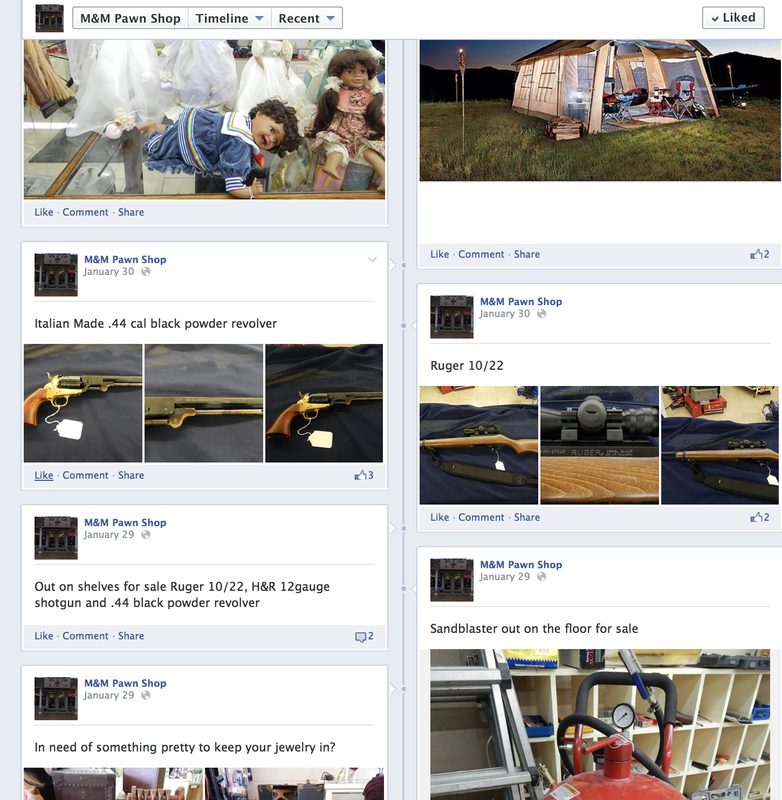 In the end, I wound up Liking their Page and will probably stop in store sometime. Effective marketing. 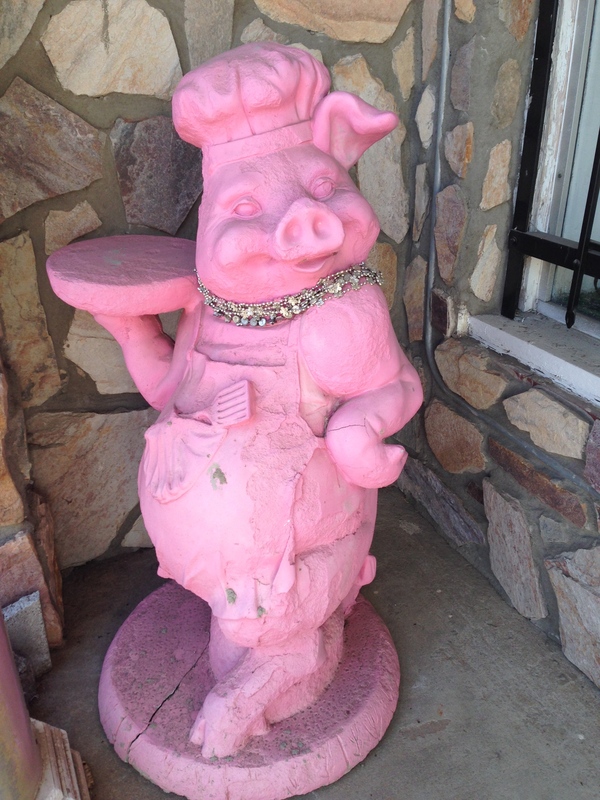 Their pink sidewalk pig, as tacky as it is, made me stop as well. You have to wonder if they just thought it looked funny or if they were subconsciously referencing Pearls Before Swine. “Pearls before swine” and “casting pearls” refer to a quotation from Matthew 7:6 in Jesus’s Sermon on the Mount, implying that you should not put what is valuable in front of those who will reject the notion that it has value and furthermore that they will seek to diminish or destroy what you offer. Given that this pig is actually wearing the jewelry – is the message that some Pigs will realize the value and put them on? Carolina Plott Hound, the top NC conservative news aggregator, has published three of Greensboro Observer’s stories in the last week. 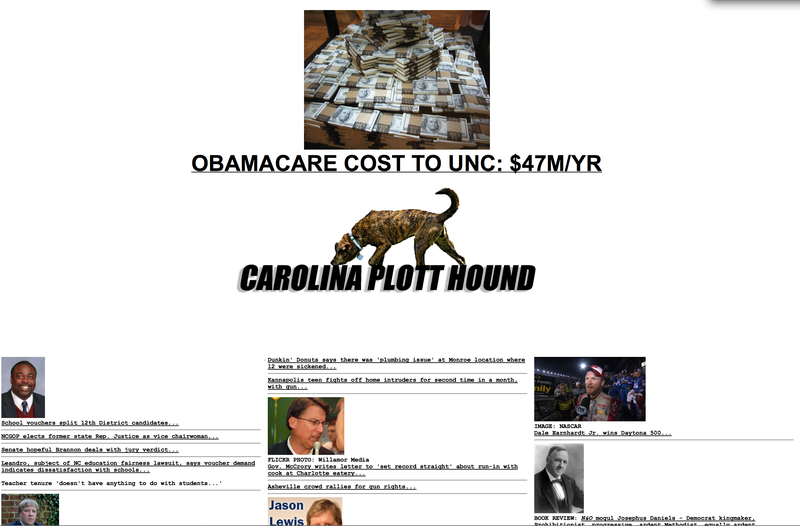 Today CPH’s top story is Obamacare (ACA) to Cost UNC $47 Million. Last week they linked to stories about UNC Financials and UNC Foundation Financials – both stories contain Excel spreadsheets and detailed numbers in an effort to provide greater transparency to the people of our State. 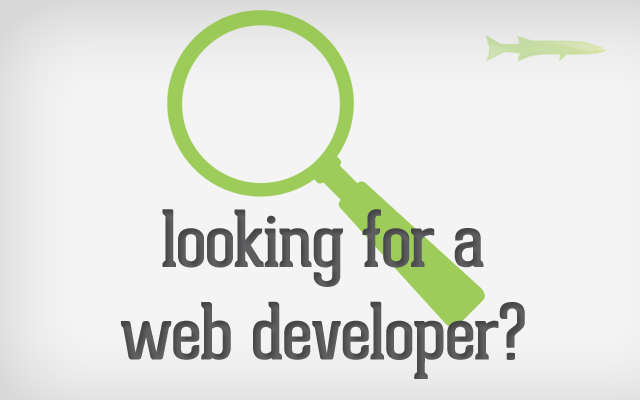 We are searching for an outstanding web developer to be responsible for developing innovative, reusable Web-based tools. The applicant should be able to develop specifications and make recommendations on the use of new and emerging technologies. Programming, graphic design and database administration are all elements of this position. Experience and/or knowledge of mobile apps is required. Work closely with an in-house graphic/interactive designer to produce visually appealing material for websites and mobile apps. Convert raw images and layouts from a graphic designer into CSS/XHTML/HTML5 themes. Communicate with efficiency and accuracy any progress and/or delays. Engage in outside-the-box thinking to provide high value concepts. Restaurant Investors is a restaurant company with multiple concepts operating and in development. We offer career growth and competitive benefits. We are located in the Greensboro, North Carolina area. Restaurant Investors is a well-capitalized company and it’s parent company, Kotis Holdings (http://www.kotis.org) is the Triad’s largest retail shopping center developer. New locations and growth are a part of company objectives. Competitive benefit package available. Beerby is our proprietary beer app available for iPhone or Android. It allows you to track and take notes about what beers you drink, find good beer near your current location, discover bars that carry your favorite beers, compete with your friends and more. We are looking for a developer/programer that can help us take this app and new ones to the next level. Salary commensurate with experience. Apply through contact form. I saw this primitive version of Twitter in a bathroom hallway at the Persephone Bakery in Jackson Hole, WY last month. Overlooking the poor location (it was a small space) and hygiene issue, it was an interesting idea. 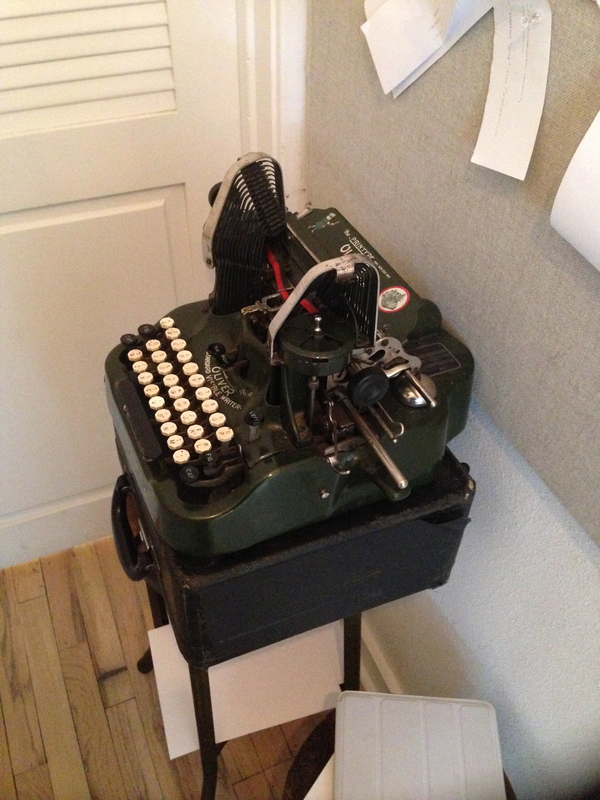 You take a recycled slip of paper (pre-torn into small slips), put it in the old typewriter, type a note, then place it on the wall with a thumbtack. Poems, love notes, jokes, messages between people, adages and observations covered the wall. The thought-provoking question is – Why? Perhaps because it was a machine or toy, people wanted to play with it. A new technology to a youth. A nostalgic one for someone older. Maybe a grandfather wants to show his grandson in the same way a grandson wants to show grandpa the latest technologies. Or perhaps a means to connect with someone that you know, or someone you haven’t met. Sitting in the dining area watching the hallway to see if someone reads the message, if it makes them smile, laugh or frown. Did people feel like they needed to type something to fit in, because everyone else had? Or did they dismiss it as too cutesy. What did it say about the person if they stopped to read, typed something or didn’t type something. When more people were around, did some people use it more often, or less often. It could have been a way to leave a mark, to let people know you were there. 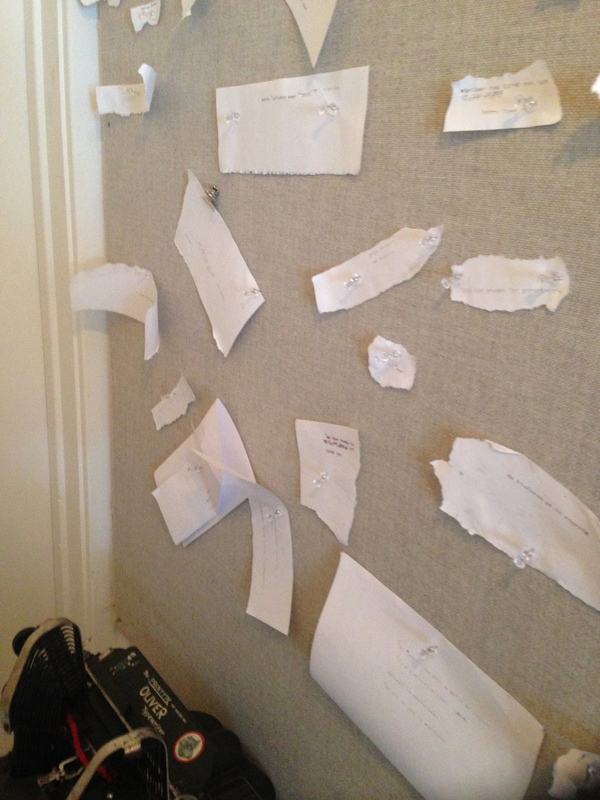 Or writing a note in response to something you saw on the wall – to chime in or to contradict. Did they choose to type their name on the slip and was it a real name. It makes you also wonder if people reading the slips took down any objectionable ones or was that up to the management. Were there unwritten rules for typing on the wall. And did the bakery put the typewriter in as a marketing idea or for inspiration. I didn’t type a note, but I kind of wish I had. Most of my Friday was spent at the Proximity Hotel and Print Works Bistro. It involved a breakfast meeting, Bordeaux blending dinner and being lucky enough to get bumped up to the Presidential Suite. Saturday morning, with perhaps a judgement impairing hangover, I decided to launch a blog. The day started with a breakfast meeting with a local blogger to talk about some web and tech projects we’re planning to tackle this year (websites, domain management and monetization, and the Beerby app we acquired). My longtime web developer is retiring and that, coupled with the new projects, has me searching resumes and reviewing proposals. We’ve reached out to UNCG and NC A&T, posted a job description on Monster.com (included in follow up post). Perhaps the interesting discussion planted a seed about blogging. Apparently blog seeds need lots of wine to cultivate them. That night we attended the Proximity’s Blend Your Own Bordeaux Dinner. The winemaker, Trinchero, lays out four single grape wines – Cabernet Sauvignon, Merlot, Cabernet Franc, and Petit Verdot (they didn’t include Malbec, which was probably wise given the quantity of wine). These grapes are typically used in blending a Bordeaux or Meritage wine in the Bordeaux style. You have four small carafes of wine in front of you and the trick is to make your own blend. Typical blends are high in Cab Sav and Merlot with lesser roles played by Cab Franc and Petit Verdot. There is also a competition for best blend name, but alas our Cab Ride of Shame and Chat the Front Door didn’t win. The dinner was paired with rooms, so a group of us gathered in one of them and stayed up late (well 40-something late which is midnight). Have you ever noticed that people that have too much to drink sound and look like stroke victims? We got back to our room and I vaguely remember going to sleep. When we checked in, we had the good fortune of getting bumped up to a very nice suite on the eight floor. I learned that President Obama had stayed in that room and that his entourage took the entire 7th and 8th floors. The room had several sitting areas, a dining area, two full baths, and a separate bedroom and sitting area. The view was amazing, with lots of open land in Green Valley below that could easily house a Trader Joe’s and shelves of their two-buck Chuck. The next morning, thinking how odd it was that I too was pondering health care as I was searching for Advil, I had the presidential idea of starting a blog. I’m a big fan of technology and social media, so this seemed like a good idea. Of course, my blog may be as disastrous as Healthcare.gov‘s launch and my grammar as bad as Sal Leone’s. But I welcome any and all suggestions/corrections. On Facebook, I changed course over the last couple of years and culled my friends list down from the hundreds to less than 100. I use my LinkedIn profile to connect with most of my professional contacts. I’ve tried Twitter, but I can’t look at my phone that often. Much of my posting is through my various companies Facebook pages – Kotis, Darryl’s, Marshall Free House, Pig Pounder, Burger Warfare and Yo Daddy. I enjoy reaching down past the layers of management and having short conversations with the restaurant guests. Each of those pages has its own personality, so this will be somewhat different. I picked Greensboro Observer because 1) I had the domain, 2) it will contain my observations, and 3) it’s as close as I’ll get to owning a newspaper. I tend to gather much of my news by reading the News & Record, Yes! Weekly, Rhino Times, Triad Business Journal, WSJ, USA Today and BBC News on my iPad. For some local dish I also visit Greensboro101, Billy’s, George’s blog and Triaggregator, Fec’s and Ed Cone’s. Each has a different voice and I skim through for interesting stories or comments. Carolina Plott Hound has some conservative editorial headlines from all over the State, The Daily Tar Heel for UNC news, and I also use various alerts and search terms. I’m sure I’m leaving some out, but this isn’t an acceptance speech. The topics I plan to cover in this blog include: Commercial Real Estate, Restaurants, UNC System, Government, Beer/Wine/Mixology, Travel, Social Media, Technology, and Architecture. I’m going to post a few articles at once to get it started, then likely settle into 1-2 posts per week. Again, I welcome any feedback and hope you’ll enjoy the blog.